At Thanksgiving dinner this year, my host waxed ironic about the incipient Black Friday, which would begin at 5 AM with some "when they're gone, they're gone" super special deals at places like Fry's. But not for me; I managed to laze about on Friday, finally dragging myself to a couple of emporia around noon. After finding nothing I wanted at the Apple Store (the brick & mortar one in Palo Alto), I went across the street to Borders, housed in a building that was once a gracious theater. Didn't buy anything there either, although I was pleased to notice that Bill Bryson has a new book out. I discovered Bryson on a business trip to Denmark of all places; desperate for something, anything to read, I picked up one of his books on the derivation of English words and phrases and was almost immediately hooked. After that it was all of his travel books, although as I wrote elsewhere, his are not the kind of travel books that make one want to follow where he leads. And here comes another one, although in this case we couldn't follow even if we wanted to. Because, you see, the destination is the past, specifically his own past in the Middle America of the 1950s. I have to confess to not having read or listened to The Life and Times. Not yet. But it's on my iPod, and just waiting for my next road trip. The perfect thing to fill the empty spaces between towns in the deserts of California, Nevada, Arizona, Utah and back to Nevada. Stephen Colbert's performance at the Correspondents' Dinner has to be one of the great WTF! moments of 2006. Not for what he said, but because anyone expected something different. In much the same way that Jon Stewart punctured the pomposity of the hosts of CNN's Crossfire and was accused by these media windbags of "just not being funny", Mr. Colbert dared speak "truthiness" to the president and the press corp. (Or should that be press corpse? Check to see if they're breathing.) And the verdict among those in power, or kneeling at the feet of power, is the same: "not funny". Me, I think it's hysterical. And not just because I enjoy the spectacle of the leader of the free world being discomfited, although that's true enough. This is what Stephen Colbert is good at, what he's known for. How can anybody invite him to roast the president and the press and not expect him to turn the dial up to broil? Some of us like our dead meat cooked well done. And with this audience, that's rare indeed. 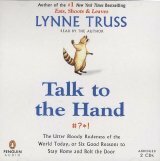 Lynne Truss is cranky and middleaged, which are two somethings she and I have in common. I first made her acquaintance in a slim volume called Eats, Shoots & Leaves, a wonderfully articulate dissertation on the history and function of punctuation and a rant on all the world's abusers of same. Now she's back, with another slim volume on another rant-worthy topic: the decline of civility in the modern world. Subtitled "The Utter Bloody Rudeness of the World, or Six Reasons to Stay Home and Bolt the Door", her new book decries our more casual and far less civil society. Her efforts are likely to be in vain, I fear. But if we pause for even a second to consider what we've lost, maybe it will have been worth it. Besides, when the author is this witty and bright, how can she not be worth at least a listen? One of the pleasant surprises of running this blog is the occasional email I get from musicians. Sometimes it prompts a review; more often it's a response to one I'd done a while back. And so far at least, the reactions have all been positive. Which is nice, because I've always tried to say what I believe without fear of recrimination or hope of favour. No pandering here. Well, until now at any rate. Because the author of this audiobook is a good friend, a fellow survivor of one of the more inept Silicon Valley startups ever to waste millions of Other People's Money. He's turned from that to best selling novelist; me, I write blogs. Fortunately, he's better at novels than I am at reviews. 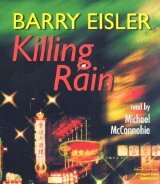 And I can recommend Barry's John Rain series without reservation; I'd be reading them even if I didn't get my copies for free. 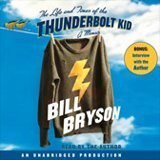 This audio edition is of the fourth and latest book in the series. Sadly it's the only one to show up in the iTMS so far. I'd start at the beginning, with Rain Fall . Besides, your internal voice is likely to be more compelling than the guy they got for this reading. I know the character's a killer, but it's his victims who are supposed to be lifeless. But whether you read or hear these books, be prepared for one hell of a ride. And if you run into Barry, tell him he owes me one. It was back in the third grade, I think, although it may even have been the second. I was trolling the school library and found this book. It might have been the title; even then I could enjoy a good cultural reference. But whatever the reason, I took it and read it. I don't know how much of it I understood, although little bits stuck in my memory. The title, alas, was not one of them. And for years later I wondered about that early, perhaps even first, encounter with science fiction. A little over ten years later I was practically inhaling Heinlein: his early adult work from the 40s, his more explicitly adult work from the 60s and, as it came into paperback, the 70s. And, as they were republished, his juvenile fiction from the 50s. Including this volume, which I recognized almost immediately as that book from the PS 162 school library. And enjoyed in ways that younger me couldn't. Reading Heinlein's words are a pleasure. Having them read is a different pleasure. And having them partly acted out, with different actors giving voice to the dialogue, is different still. This production gives life to Heinlein's characters. Well, more accurately it lets us enjoy the life that was already there. Of all the great SF writers, Heinlein was in my view the best writer, the one who could create characters and situations that felt the most human. And it may be that in his juvenile fiction he reached the peak of his humanity, before his interest in politics and, if I may say, his obsession with sexuality took over. I love this book, both for itself and for its ability to invoke memories of that early precocious-but-innocent self. And to wonder how to get a little bit of him back. There I was, minding my own business. Not looking for trouble, just some nice music to share with you nice people. And one album led to another, as it tends to do. And that one led to an iTunes Essentials collection called Guilty Pleasures. I should have known better; Mom always said if you pick at an injury it won't heal. But I didn't listen then. And I'm no better now. Most of the Guilty Pleasures were definitely the former, although I didn't think of too many as the latter. And then, on the Deep Cuts tab, I found it. On the same page as Barbra Streisand and Neil Diamond doing You Don't Bring Me Flowers was the legendary album, that blast from the 60s we still joke about today: William Shatner's Transformed Man. 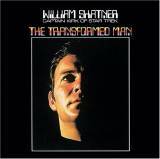 On the off chance you haven't heard about it, Transformed Man consists of Shatner performing dramatic readings, most famously of songs like Mr. Tamborine Man and Lucy In The Sky With Diamonds. Why he thought Dylan and The Beatles would be improved by being recited rather than sung, one can only speculate. I have one real regret regarding this album: that you won't be able to appreciate its true iconic power from thirty second snippets on the iTMS. The good news is that this collection of classic sixties ham & cheese is a steal at $5.94. Heck, the original cost almost that much. And that was in pre-inflationary dollars! Why is it that some of the most inventive and entertaining literature is written for children? Not just Harry Potter, as good as it is. There are plenty of other children's books that an adult would enjoy as much as, if not more than, a child. We can enjoy the story, as well as the way the author plays with the structure, the language, the imagery of their storytelling. The best kid's literature plays with the form. It takes risks. And what riskier endeavor has there been than A Series of Unfortunate Events, a collection that warns the reader right from the beginning (The Bad Beginning1, to be precise) to be prepared for one unpleasant experience after another. And that teaches valuable lessons about the way the world really works, how adults can't see what's right in front of them, how they never appreciate the valuable insights of children, how children have to find their own strength and develop their own gifts. Okay, I'm reading way too much into the Series. But trust me that they're fun. The audiobooks are just the right length for a longish drive or flight. And Lemony Snicket (actually author Daniel Handler) takes just the right tone in telling his stories. His pedantic monotone is a nice match for the material. So I'm not embarrassed to be caught reading or listening to A Series. Or Artemis Fowl. But do you think they could make adult covers for The Princess Diaries? Note that the audiobook for The Bad Beginning on the iTMS is performed by Tim Curry and a cast of other readers. I don't know how it compares to Mr. Snicket's solo efforts. It's the day after Thanksgiving. Which means two things: turkey leftovers, which I love; and the start of the Christmas onslaught. Now I grant that, as a non-Christian, I'm not the target audience for this stuff. But does it have to be such dreck? Does it have to be so awfully serious (and seriously awful)? Heck, even Dragnet dropped its "The stories you are about to hear is true" when Christmas came around. Which is why I'm grateful for Christopher Moore. I first discovered Moore through his book Island of the Sequined Love Nun, just the sort of thing to gladden my diseased soul. And I discovered his willingness to use even the most sacred tales when I saw and then devoured his brilliant Lamb: The Gospel According to Biff, Christ's Childhood Pal, a far smarter and insightful tale of the zeroth century Middle East than you're expecting. Moore is like Carl Hiaasen on drugs. But good drugs. Which brings me to this latest work, just in time for the holidays. The Stupidest Angel: A Heartwarming Tale of Christmas Terror is just what we need in these faith-challenged times. Because in a battle between faith and a sense of the absurd, absurdity will win every time. Or at least two out of three falls. There is strong evidence that regular viewers of Fox New Channel (where "Fair and Balanced" isn't a belief, it's a slogan) are less well informed than the public as a whole and hold many beliefs that are in direct opposition to the facts. The flip side of the disaster that is "We Report, You Decide" may be found at Comedy Central, home of The Daily Show. Regular viewers of this program are, studies show us, both better educated and better informed than their brethren (and sistren, can't leave them out) who rely on the traditional networks or their cable descendents for both their facts and the interpretation thereof. Which must leave Jon Stewart and company both proud and deeply embarrassed; educating the public is the last thing on their collective mind. But educate they do, even if only because the only way to get all the jokes is to understand their context. 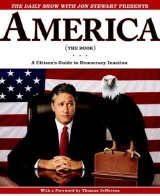 And so it is with America (The Audiobook) - A Citizen's Guide to Democracy Inaction. Because if often a truth is said in jest, these folks are past masters at delivering both in large quantities. One warning, though: do not attempt to listen to this audiobook while driving. The risk of cracking up while you're cracking up is all too real. And with the election looming, we can't afford to lose a single well informed citizen. Now for something a little bit different (with apologies to Monty Python). I live in Silicon Valley, which is about two hours by car from Napa and Sonoma and the wineries therein. (No, I don't normally talk like this.) And I've spent a fair amount of time driving around the region and stopping at particularly promising-looking wineries to sample their wares. (Yeah, another example of archaic locution. I'll stop, I promise.) But I'm hardly an expert on wines or wineries. I have friends who are wine snobs; I'm more of a wine slob. But that doesn't mean I'm not interested. 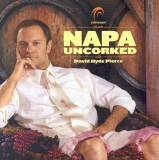 And this short audiobook is a great introduction to wine production in California and the specific attractions of Napa County wineries. David Hyde Pierce trades on his Niles Crane persona from Frasier, acting both superior and tres amusant. The whole effect is both entertaining and informative. And just the thing for a boring flight. Or a drive through Wine Country, for that matter. Guess I really should pick up the Sonoma County companion volume next.